Friday marks the 21st day of the shutdown, tying it with the 1995-1996 government closure for the longest funding gap in modern history. On Thursday, public service union members rallied near the White House for an end to the impasse and the Senate passed a back pay bill. The Transportation Security Administration is one of the most visible agencies with unpaid workers during the shutdown, but aviation is hit in many places by the shutdown. 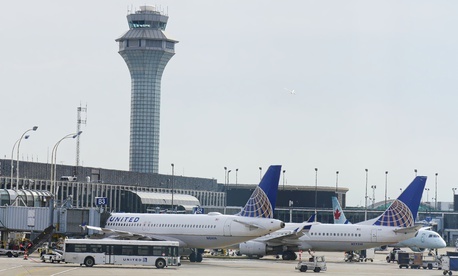 According to CNBC, the Federal Aviation Administration is also heavily affected by the shutdown, including through furloughed aviation inspectors and delays in approval for new routes. A group representing the pilots union, flight attendants, mechanics and airline trade sent a letter to President Trump and congressional leadership pleading for an end to the shutdown. "This partial shutdown has already inflicted real damage to our nation's aviation system and the impacts will only worsen over time," said the letter. Read more at CNBC. With a possible national emergency declaration in the news, the Federal Emergency Management Agency, the agency largely responsible for emergency assistance, has had to cancel many of its private contracts. According to TYT, the Homeland Security Department issued a notice to FBO.gov instructing private contractors to cease operations. “A full year appropriation or a continuing resolution has not been enacted for the current fiscal year. As a result, certain existing contracts will be stopped,” the notice said. TYT noted a few of the canceled contracts, including one "with the firm SOPAKCO Inc. ... to provide 43,200 food rations for Customs and Border Protection staff deployed to Puerto Rico." Read more at TYT's site. Local county governments will be hurt more by the shutdown the longer it goes, according to our sibling site Route Fifty. Washington State Association of Counties Executive Director Eric Johnson told Route Fifty: “If we continue long term, cash flow is a real issue for certain jurisdictions that are floating dollars with the hope of getting WIC reimbursement.” He noted the gaps in wildfire funding that counties will see with the government shutdown. Read more at Route Fifty. The Environmental Protection Agency furloughed most of its pollution inspectors and other pollution monitors, causing concern among public health experts and scientists. The New York Times spoke to a furloughed EPA inspector and he warned of wastewater flowing into streams and rivers. He also said "places that store hazardous chemicals in containers that could leak" are not being inspected. Former EPA officials compared the inspectors to police. They are “the cops on the beat,” Cynthia Giles, who headed the EPA enforcement division during the Obama administration, told the paper. Read more at The New York Times.